Warning: Only buy the Kingston DataTraveler 150 from reputable dealers, a lot of the cheap drives that are circulating on eBay and other sites are counterfeit! These products may look almost exactly like the real deal but some of them don't work at all and others suffer from various issues like slow performance and significantly less storage capacity than advertised. Over the years flash drives have become much larger, in terms of storage capacity, and more affordable. For the same price of a 256MB USB stick five years ago, you can now buy sticks with a capacity of 32GB such as the Kingston DataTraveler 150 32GB, which is the subject of this review. This drive not only offers 128x as much storage capacity as the drive you would have got five years ago - it's also a lot faster. 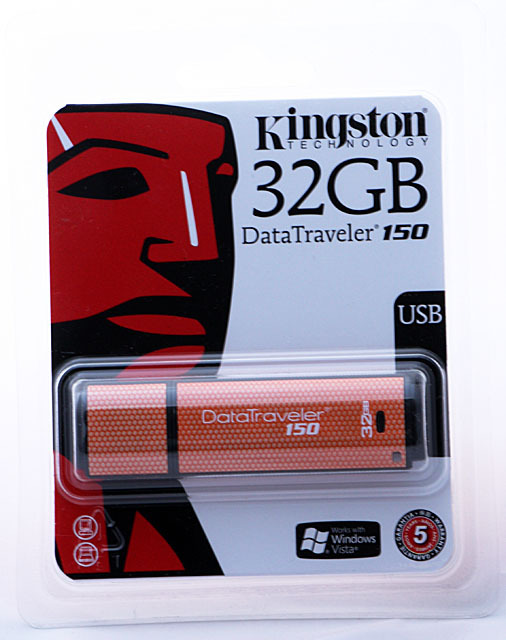 The DataTraveler 150 is the largest USB drive in Kingston's product lineup and it's backed by a five-year warranty. The drive ships in a rather standard plastic blister package, and the only extra is a small keychain ring. Oddly enough Kingston didn't list the data transfer speeds and unlike most new USB drives, this stick doesn't support Windows ReadyBoost in Vista. I don't know for sure why ReadyBoost isn't supported but it's not really such a big deal. The performance boost from ReadyBoost isn't that big and if you really want to use this feature it's a better idea to buy a cheap 1GB or 2GB USB stick instead of this 32GB model. Lets take a closer look at the Kingston DataTraveler 150. The design of the DT150 is rather odd, the memory stick has a salmon colour with a honeycomb pattern. I'll let you decide whether it's a hottie or a nottie but it definitely stands out from the crowd. Below is a photo of the back of the USB stick, besides a blue LED that flashes when you're transferring data there isn't really much to see here. The DataTraveler 150 doesn't have a capless design but it can be attached on the end of the device to prevent loss of the cap. Inside the package of the USB drive there's also a small keychain ring which can be attached to the drive. IN BANGALORE ESPECIALLY IN SP ROAD THIS KINGSTON 150 IS AVAILABLE IN DUPLICATE THAT WAS NOT MANUFACTURED BY KINGSTON.SO HELP KINGSTON BY REFUSING LOW PRICE FLASHES. these are very slow usb flash drive.u can opt for sandisc or HP flash drives. i have my kingston data traveler 150 32GB and everytime i used it it always error or warning popup to my screen says make sure you file or path something like that and i worried its fake oh no... how is it..
For the German commentator below: Did you buy the USB stick through the official retail channel? The issues you describe sound a lot like those fake USB sticks that are sold through places like eBay. These fake sticks may look the same but they aren't made by Kingston. Das ist alle letzes Dreck, funktioniert nichts, beim jeden Transwer Probleme und Fehlermeldungen. Speicher Daten bis 3 MB sonst garnichts! Fake, Dreck alles nur nicht ein USB Stick, Finger weg, heraus geschmissenes Geld!!! Nichts zu reparieren! The DataTraveler has been heavily faked by Asian scammers. Slow read/write speeds is generally a sure indication the drive is a fake, also the fakes have in most cases a 16GB chip & not a 32. Great stick, very fast and plenty of storage capacity. Get an RMA, your drive is faulty. I purchased this just a week ago and it errors out every time I try and copy large files (>1mb). It errors with the message Data error (cyclic redundancy check). I have tried it on several PCs but the same error comes up. It works fine with small files but what is the point with a 32gb device? thank u very much for the review, especially the benchmark, that was what i was looking for!